UV is a type of energy found in the electromagnetic spectrum, lying between x-rays and visible light. Although we cannot see UV light or rays, we are exposed to them every time we step out into the sun. UV light is responsible for causing sunburns on uncovered skin. Ultraviolet systems use special lamps or bulbs that emit UV light of a particular wavelength. The Ultraviolet energy attacks the genetic core of the microorganism and rearranges the DNA /RNA eliminating the microorganism’s ability to function and reproduce. If the microorganism can no longer reproduce, it cannot replicate, therefore it cannot infect other organisms with which it has contact. The process is simple but effective, destroying 99.99% of harmful microorganisms without adding chemicals to the water. 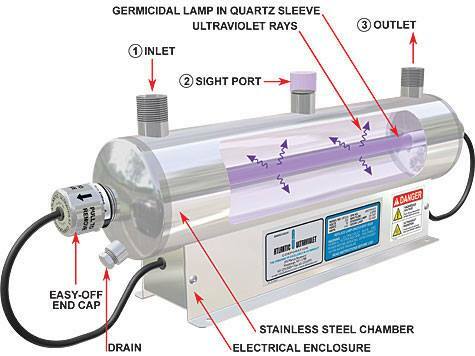 Effective: Virtually all microorganisms are susceptible to ultraviolet disinfection. Fast: Water is ready for use as soon as it leaves the purifier no further contact time required. Automatic: Provides continuous disinfection without special attention or measurement. Versatile: Capacities available from 1.5 gallons per minute to millions of gallons per day. Obtain information about your water source and have it tested at a state or EPA certified laboratory. Get your water tested at subsequently appropriate intervals as determined by you and your water treatment professional. Determine which problems are associated with infrastructure deficiencies, i.e., cracked casing, no cap, improper seal, poor surface drainage, etc. Make the necessary repairs and improvements to the system. Install the necessary water treatment systems.